Ahhhgh! 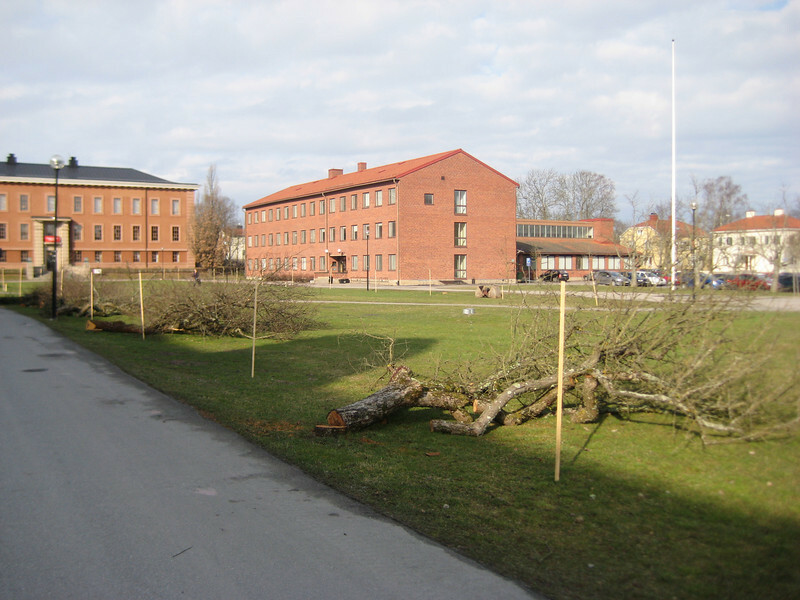 Someone had cut down all the apple trees lining the EBC lawn, and just before they ought to have blossomed. They looked fine this morning! Why has this happened? Close inspection of the downed trees revealed that many of them were in fact in bad shape, with bark coming off, and cores that were becoming hollow. Many of them were also covered in lichens, which is very attractive but probably not good for the tree. And the final straw, apparently, was the proliferation of this red stuff on the bark (some kind of fungus? ), which is said to be Bad, and capable of spreading to other trees. "Originally the plan was to use clones taken from the old trees, but the quality of the clones was not sufficient. The clones will though be planted in other parts of EBC." Our botany department traces its heritage back to Linnaeus himself, but our clones weren't good enough? Oh the shame of it. Watching the installation of the saplings has been sort of surreal, because I have never seen any of it actually happening. I go in in the morning, and things are one way; I come out at night, and things have changed. For all I know, the work is being done by tree elves imported from Finland. One day, the old trees were lying on the ground, cut off at ground level, then they disappeared. Next day, holes appeared where the stumps had been (although the old roots weren't dug up so much as cut off). Sometime thereafter the holes were filled in with dirt. After that, more dirt was piled up so that each hole now had a four-sided pyramid of dirt poking up out of it. This last Wednesday, the pyramids were leveled off. 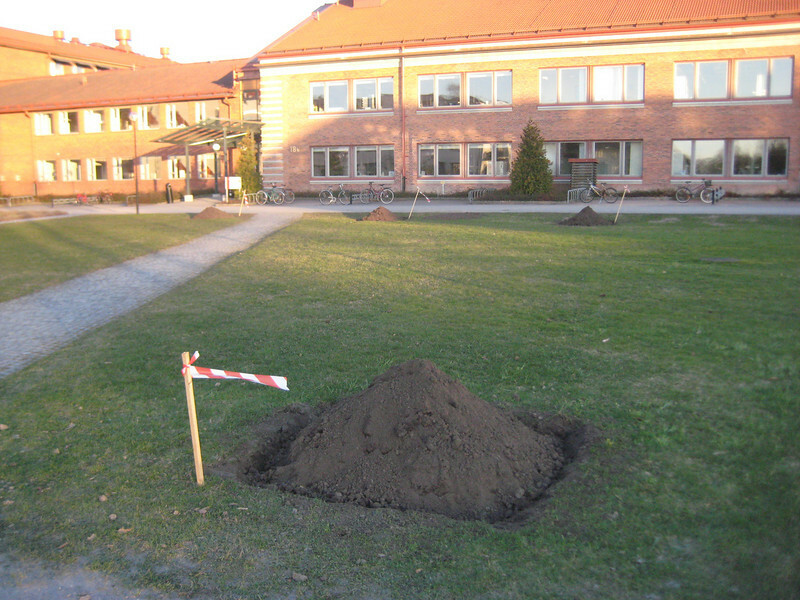 Yesterday, small holes were dug in the pyramids, and between morning fika and afternoon fika, the 3 m high saplings arrived. When I arrived this morning they had been planted; by afternoon, they were trussed to supports on either side. 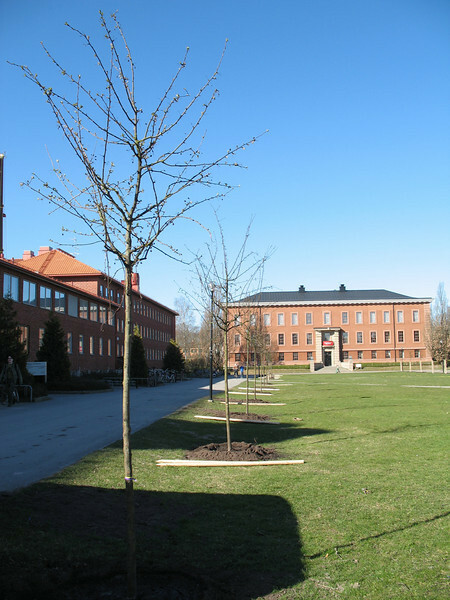 So I mourn the loss of the old trees, but I look forward to seeing the new trees take root, and many years from now, if I ever come back, I can say that I was here when these trees were planted. By unseen Finnish tree elves.